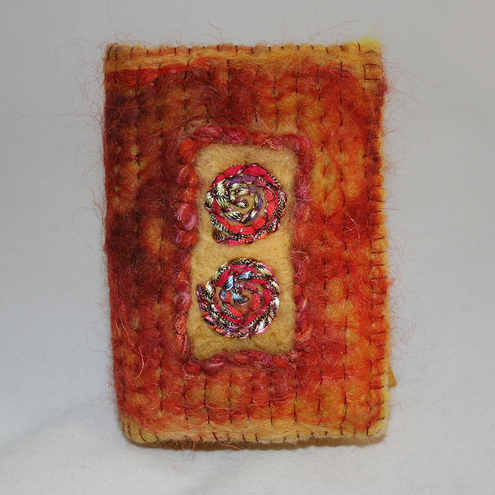 Folksy :: Buy "Embroidered Notebook with pencil"
A beautifully soft and tactile item - entirely felted and stitched by hand and decorated with a hand embroidered panel - a little touch of luxury!. A colour coordinated 'mechanical' pencil, and a pad of sticky notes, are included. Folksy :: Buy "Small Posy Brooch - Needle Felt/Embroidered "
Folksy :: Buy "Medium Posy Brooch - Needle Felt/Embroidered "
Folksy :: Buy "Heart Posy Brooch - Needle Felt/Embroidered "